Wrinkles and frown lines develop as a result of using facial muscles repeatedly over many years ,with the skin creasing in areas of greatest use. In addition, the aging process causes the slowdown of collagen and elastin production in the skin, so eventually these lines can become permanent. Sun damage can also be a major factor. Injecting botox in micro amounts temporarily relaxes muscles in these areas, the skin stops being creased and recovers, causing the lines to soften or even fade away. It also allows the patient to break the subconscious habit of over-using these muscles. It is safe, quick, reliable and with virtually no downtime, results in a more youthful, refreshed and relaxed appearance. We favour the subtle and precise use of botox, so that the skin improvement is achieved, but without being ‘frozen’. We offer a review after 2 weeks to monitor your progress. 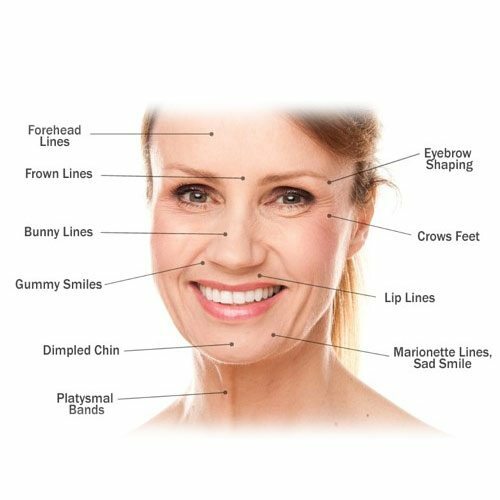 Depending on the area treated, and how you respond to Botox®, repeat treatments may be required around every 4-6 months. Crows feet, frown lines, forehead lines. Gummy smile, smokers lines, defining the jaw line/narrowing the jaw, dimpled chin, neck lines, decolletage (upper torso). Very small needle injections in targeted muscles to suit your concerns. The effects of the Botox start at 2-3 days after injection, and at 2 weeks the result can be reviewed. It can vary from patient to patient but on average the effects will last for 3-6 months.